Kuta in addition to being the sunset site number one, with its daily spectacular sunsets, it is also the centre of night life activities in Southern Bali and a shopping mecca, with its lines of shops, boutiques, and galleries, tattoo parlors and travel offices. Restaurants line up the streets as well as the beachfront, hotels, ranging from a small, inexpensive homestay to a luxurious resort, will ready accomodate you. Set on Asia’s most famous surf beach and stretching out long a miles of golden sand, Kuta is a center of entertainment, sport and relaxation. For thrill seekers, the opportunities are endless – you may try bungy jumping, surf surfing, sky diving, paragliding, wakeboarding or gocart racing. Bali’s waves are world famous and range from safe beach breaks for beginners at Kuta, to the awesome swells at Uluwatu and Nusa Lembongan, which regularly attract the world’s most adventurous surfers. 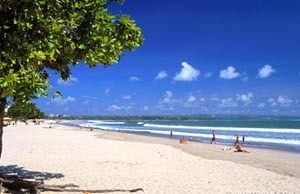 The beach of Kuta is one of the first favorite beaches discovered by tourist. On the south, the beach is fenced by the airport's runway, which gives you a breathtaking landing experience. The beach stretches as far north as the eyes can see. As short walk away north, waves will invite you to test your surfing. Kuta is very short drive away from the airport, and transportation is readily available to take you from and to Kuta to and from anywhere else in Bali. Along the north of Kuta, Legian street offers a number of high quality boutiques, excellent restaurants, cafes and bars influenced by western style. Exclusive hotels can be easily found in Seminyak, further north of Kuta, while antiques wooden furniture shops in Jalan Raya Kerobokan. On the other hand, no-one will think the worse of you if you spend your time soaking up the sun and relaxing. In fact, teams of masseurs and other alternative health professionals will work hard to help you achieve the perfect state of equilibrium as you lie on the beach or the massage table. With excellent spa facilities, a full range of natural treatments are available for both men and women. Nor does the fun stop when the sunsets. Kuta’s bars and discos offer something for everyone, from quiet, open air-bars near the beach where you can have a soothing drink before bed as you gaze at the stars or into the eyes of your lover and let the sound of the surf wash over you, to elegant hotel lounges where you can enjoy a grasshopper or an Irish coffee, to rollicking, raunchy beer barns that are very much designed with young singles in mind. So what are you waiting for?